This is my first attempt at a nano planted tank. Previously, I'd set up a 48 gallon freshwater and a 56 gallon saltwater. It's something else to work with a much smaller setup. Here's a shot of the overall tank. I'm currently building a hood which will house the lighting fixtures. The driftwood has stained the water yellow. Here's a closeup of the filter. The heater is submerged with a heater guard around it, to prevent it from touching the edges of the filter. You can't quite see the guard in this shot, though. I also stuck the filter sponge in front of the outflow, to soft it. To make the filter work on such a small tank, I needed to mod in the intake tube. I used a piece of flexible plastic and an intake filter from an Aquaclear 30 filter. I used a piece of sponge and aquarium silicon to seal off the edges. The end result is that even using the AQ 70 impeller, it puts out a lot less flow than normal. In fact, I think it even puts out less flow than my AQ 20 on my 10 gallon QT. Finally, a couple shots of the aquascape. I was inspired by Filipe Oliveira's "Across the River" tank, so I decided to try something similar. For flora, I was thinking java fern at the back, dwarf anubius at the base of the driftwood, Hydrocotyle verticillata (pennywort) in the middle, and something for the foreground. I was also thinking maybe some sort of stem plant (Rotala?) in the back for contrast with the java fern. For fauna, I'm planning half a dozen Hengel's rasboras. And... that's it for now! Hopefully, I'll have the hood finished and painted by sometime next week, so I can begin planting this tank. I'm amazed , everything seems fine! the wood and rocks realy do make the tank look bigger ...well done. But did'nt the intake tube cause any trouble after modulating it like that? 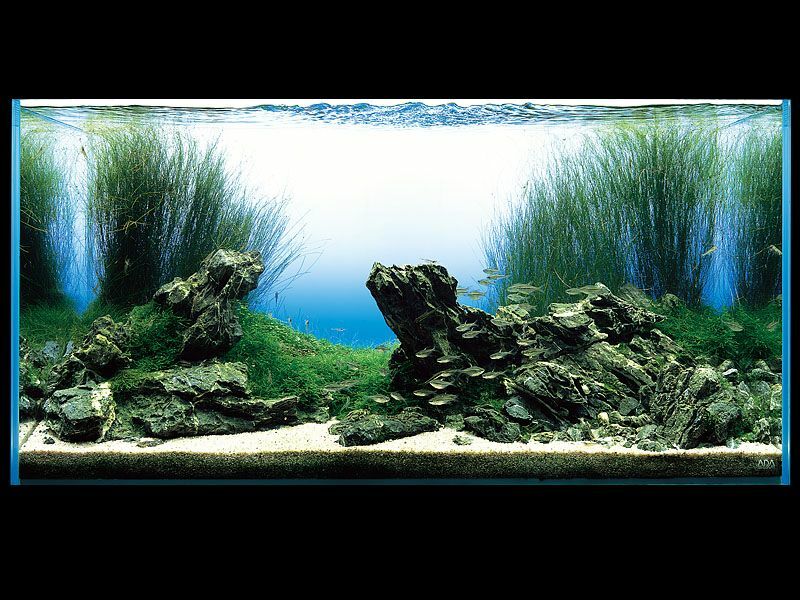 I love the way Filipe Oliveira aquascape, he is the Brazilian Takashi Amano . Congrats, you definitely found some good wood pieces and the position is great. For the back-ground color, try instead of black, to put blue. In that case it will bring out the gorgeous looking drift-.wood shape. If you ask me, I would not cover those very nice looking wood pieces with Anubias, but leave them the way they are. Because you will probably experience some Green Beard Algae, I would suggest a few Red Cherry Shrimps to graze over it and keep it low + they will add a bit of a color to this set-up. Stem plants are just to tall for this 20 liter tank and will make it look small. The way it looks now, I would say it is at least 15 gallon. Try to plant Dwarf Chain Sword as a carpet plant and Hair Grass (Eleocharis acicularis 15 cm ) behind the wood pieces. Hydrocotyle verticillata should be left crawling over the white sand, but just one plant or so. Java fern is going to grow too big eventually and will take over the wood looks, and make the tank look small. I don't recommend it. Instead of the Hengel's rasboras I would suggest Boraras maculatus http://www.picturetrail.com/gallery/view?p=999&gid=4132021&uid=704672 grows smaller and has a bit of color. You could also try Glosso for the foreground. You're really off to a great start, Pete. Dusko, I think that E. tenellus will get a bit too tall to be used as a carpet plant in a tank this size. Aqua-artist's suggestion of Glossostigma elatinoides is a good one. If you can get hold of it, Hemianthus callitrichoides "Cuba" would perhaps be even better. I believe it is easier to grow than G. elatinoides. Another plant that may be perfect (although I'd be surprised if you can find it anywhere) is Elatine gussonei. It looks like glosso, but its leaves are less than 1/10th the area of glosso's leaves. If you want to go for something rather different, you could try the carnivorous plant Utricularia graminifolia. Apparently the "traps" for catching its food only work on the smallest of insects. I love the hardscape. The design is very pleasing. I would agree that the Java fern will be too large and make the tank seem smaller than it is. The large leaves simply don't provide enough detail interest. The Glosso suggestion sounds great. If you have your heart set on a stem plant, how about one of the smaller Bacopas? They have slender stems and the leaves are reasonably small. They wouldn't overwhelm the space. Another fish you might consider is the Sparkling Gourami They have lots of personality, thrive in planted tanks, and are colorful. A trio would fit fine in your tank. Good luck. I look forward to watching the progress of your project. Very very appealing, I love your sense of aesthetics. Nice wood indeed. To fight the good fight, we must have an aesthetically appealing hobby. I think we may have gotten a bit mixed up there Dusko. I assumed that you meant Echinodorus tenellus when you said "dwarf chain sword as a carpet plant", and I still feel that this plant (E. tenellus) would grow too tall for this tank. Which plant did you mean by "dwarf chain sword"? Eleocharis acicularis would indeed look nice if it was planted as a background plant. I believe it would look great in that aquarium.